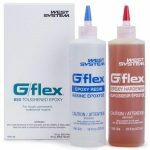 West System G/Flex 650 Epoxy - Goosebay Sawmill and Lumber, Inc.
West System G/Flex 650 Epoxy is a toughened, versatile, liquid epoxy for permanent waterproof bonding of fiberglass, ceramics, metals, plastics, damp and difficult-to-bond woods. With a modulus of elasticity of 150,000 PSI, it is a bit more flexible than standard epoxies and polyester, but much stiffer than adhesive sealants. This gives G/flex 650 the ability to make structural bonds that can absorb the stress of expansion, contraction, shock, and vibration. It is ideal for bonding dissimilar materials. It can be modified with WEST SYSTEM fillers and additives, and used to wet-out fiberglass tapes and fabrics. Mixed at a 1:1 ratio, G/flex 650 gives you 45 minutes of working time at 72°F. It reaches an initial cure in 7 to 10 hrs and full cure in 24 hrs. Larger sizes may be ordered. Special orders are subject to minimum quantities but can often be an “add on” to our regular restocking order. Once ordered, arrival time at our store is usually within 2 business days.